The Xbox 360 from Microsoft arrived in time for the Christmas season, giving Microsoft an early lead over Sony, who's long awaited Play Station 3 will be available in the spring of 2006. This is a showdown between two next-generation video game consoles, and both Sony and Microsoft hope their product will be the centerpieces of everyone's living room electronics. Although my interest lies more in the HDTV area than gaming, both products have important ramifications for the home video enthusiast because they are each supporting opposing high definition video formats that are expected to succeed the venerable old DVD players. Sony's PS3 game console constitutes a huge threat to Microsoft because it can act as a media hub as well as play Blu-ray Disc™ (BD-ROM) movies. Microsoft supports the Toshiba HD DVD format, but the built-in DVD player in the XBox 360 can only play regular DVD disks, giving Sony a big advantage. Not only is the BD-ROM capable of true HDTV recordings, Sony claims a data transfer rate five times the maximum data transfer rate of regular DVD (54 Mbps versus 10 Mbps). However, the Xbox 360 has built-in support for the new Toshiba HD DVD high definition format, so it may just be a matter of installing that type of drive when it becomes available. That may resolve your HDTV movie playback issues, but Sony still will have the advantage because the games will already be in the Blu-Ray HD format (BD-ROM), whereas Xbox games are on conventional DVD. The next-generation optical disc battle is between the Sony Blu-ray Disc vs Toshiba's HD DVD format. Players and other products using the competing formats are expected to be available early in 2006, in what some people feel could be a repeat of the costly VHS vs. Betamax videocassette recorder standoff of the late 1970's. Microsoft's rival Xbox 360, which debuted in November, can only play today's standard-definition DVD discs, and at a time when many of us are installing high resolution HDTV large screen systems in our homes, it falls short of the mark if high definition DVD viewing is of any interest to you. If you set up an HTPC with the new Windows Vista version (currently available as the Windows Media Center extension), you will be able to install an HD DVD player/recorder in your PC, but many people may choose not to complexify things that much. 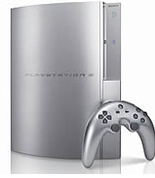 With the Sony PS3, you can have an excellent gaming experience AND watch high def DVD movies. According to the official Xbox website, the built in DVD player will upscale regular DVD from 480p to 720p (progressive scan 16:9 aspect ratio at 1280 x 720 pixels), so it's pretty good for home theater systems (direct quote from the website: "screen DVDs in 720p"). It's not a particular advantage for me, though, because we already have the very affordable Zenith DB318 that does a great job of upscaling regular DVD to 1080i. The PlayStation 3 is capable of delivering high def images at the gold standard resolution of 1080p, whereas the Xbox 360 can only reach 1080i. Not only does the PlayStation output at 1080p, it has two digital outputs, so you could run two large screen projectors at the same time at 1080p! Make no mistake, these are both very high performance platforms, and only time will tell which one will be more successful. We'll be following this competition with a keen eye, so stay tuned. We'll also be looking at a third alternative of putting together a state of the art HTPC system for hi def games and video playback.